Last night, the place to be was at the Ballsbridge Hotel, Dublin where the fully packed prestigious annual Irish Laboratory Awards took place. The impressive ballroom was packed full of excitement with a mix of talented people from multidisciplinary areas within academia, research and commercial companies from all over Ireland. This was the first time the Water Institute had attended and what a night it was. The DCU Water Institute Engineering Laboratory is a world class leader in translating basic research in the water and environmental sphere to real engineering applications. Originally set up in 2013 in recognition of the key emerging need for a water focused research institute to address the national and global water challenges, the DCU Water Institute has subsequently grown to be a technology-focused institute that generates and transforms knowledge to inform decision-making for sustainable water use. It is now at the forefront of research, development and deployment of technological solutions, and its efforts focus on the grand challenges of water scarcity, pollution, disaster risk reduction and flooding. Its aim is to further deliver solutions that address these grand challenges in an environment that nurtures talent, discovery and that enables transformation, underpinned by global developments in scientific and engineering domains. The engineering category was hotly contested with 4 other engineering labs shortlisted. Fortunately, the DCU water institute engineering lab came out the winner on the night. As the night went on the new category of Young Leader of the Year approached. The short list came down to only 2 applicants and Jenny emerged the well deserved winner. Jenny Lawler holds a degree in Chemical Engineering from University College Dublin and a PhD in membrane separations from Dublin City University. Dr. Lawler joined DCU with an industrial background, having previously worked as a chemical engineering consultant on a variety of multimillion euro projects. Her research interests include emerging contaminants and xenobiotics in global water supplies, with a focus on the development of polymeric membrane based solutions for water and wastewater treatment, along with investigation of the impact of surface nano-architecture. Dr. Lawler leads the Membrane and Environmental Technologies Group at DCU and her research has been funded by industry and agency including the Environmental Protection Agency, Enterprise Ireland, Science Foundation Ireland, and the Irish Research Council. 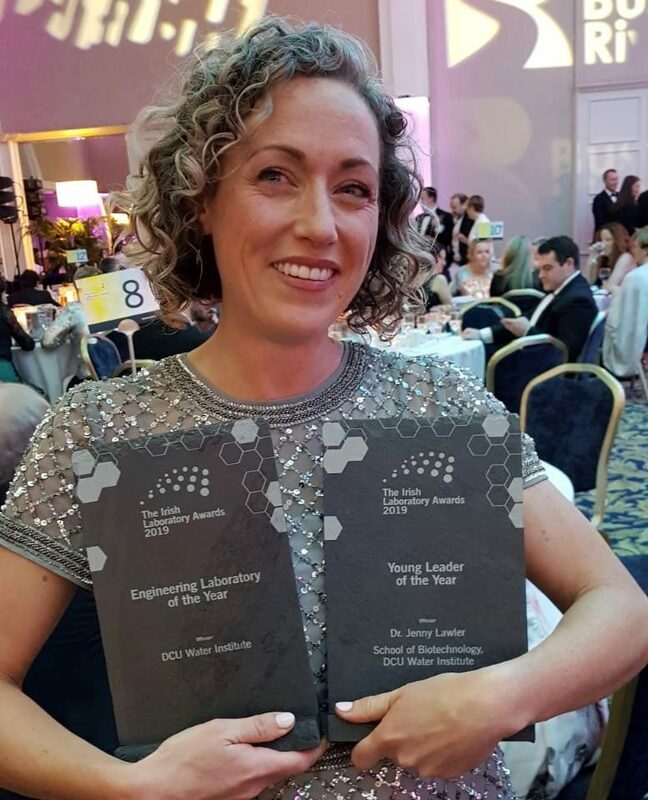 Since she established the group in 2010 upon joining DCU, Jenny has driven the growth and expansion of the Membrane and Environmental Technologies Lab, which has, in turn, made a significant contribution to the DCU School of Biotechnology (DCU SoBT) and the DCU Water Institute (DCU WI). Her research agenda is recognised as being timely and of high quality as evidenced by the funding and scientific outputs she has achieved over the past three years. She has built collaborations within DCU, within Ireland, and globally, both with academic and industrial partners. For example, the Phthalates project partners with researchers in Arizona State University and the Norwegian Institute for Water Research, with research agreements with Irish Water and Fingal County Council. The future is bright for Dr. Jenny Lawler and the Water Institute looks forward to working with her in the years to come. Overall the Water Institute Engineering Lab made the 2019 short list for the Overall Academic or Research Lab of the year, one of only 9 entries who made it to the final. These were chosen by the judges from all entries to the competition.